Rehabilitated small dam in Togo: Local communities are increasingly aware of the role of plants and forests in conserving water and soil and of the need to manage landscapes to reduce evaporation and encourage biodiversity renewal. Text and photograph from the Report. Investment in climate change adaptation can help ensure that the impacts of climate change - including a projected 20–50 per cent decline in water availability – do not reverse decades of development progress in Africa, according to a new report released on 12 August 2014 by the United Nations Environment Programme (UNEP). 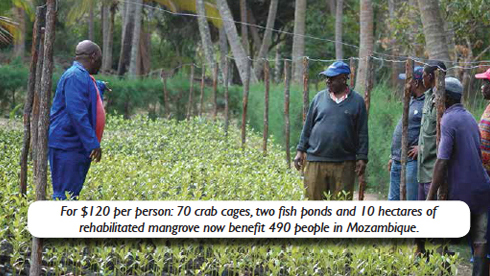 Keeping Track of Adaptation Actions in Africa (KTAA) - Targeted Fiscal Stimulus Actions Making a Difference - is the first graphical report that presents practical examples of successful low-cost adaptation solutions from around sub-Saharan Africa in one concise handbook. The first part of the report provides snapshots of the current and predicted future impacts of climate change on livelihoods, agriculture and human and ecosystem health in Africa, detailing impacts by region, country and even city. The second half of the report describes how countries through low-cost climate adaptation actions can improve the health and functioning of ecosystems; build community capacity to sustainably manage eco-systems; improve agricultural productivity; and innovatively store water. 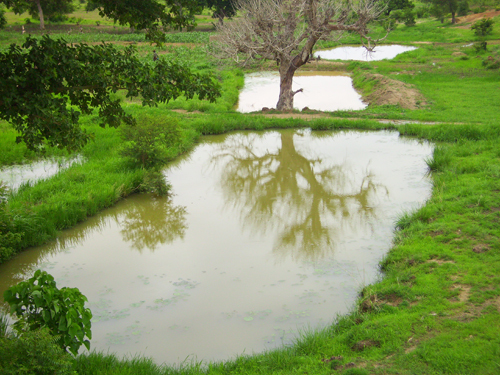 For example, an aquatic ecosystems project in one local community in Togo led to an increase in access to water for human use, agriculture and livestock of 488 per cent. 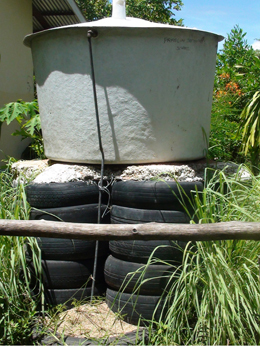 Seychelles introduced national legislation that changed school building codes to enable rainwater catchment systems. About 400 teachers and the students of seven schools in the Seychelles were educated in ecosystem management principles and schools saved US$250 each on water-related expenses. Result – In Rwanda 2,500 farmers were trained in land husbandry and 4,850 people were employed and paid via saving and credit cooperatives. Result - 432 hectares (ha) of graded terraces were established; 73.72 km of waterways, 59.77 km of cut-off drains and a 105 ha drainage system were put in place. 789 ha of forest was planted. Result - The US$100,000 project served as the impetus for the grander Rwandan Ministry of Agriculture investment of US$25 million. Result – In Uganda an investment of US$13.26 per person per year generated significant gains in ecosystem protection, livelihood improvement and the planting of over 31,000 trees. 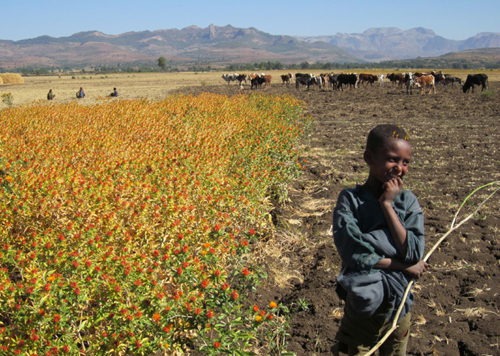 60 % of the Sub-Saharan population depend on the agricultural sector for their livelihoods. : Photograph and text from the Report. Photograph courtesy of UNEP. Result - The number of participating households with one or more surplus farm products for sale, rose from 25.9 per cent to 69 per cent. While 61 per cent of the households reported that sales of surplus farm products were contributing 50 per cent or more of their income. 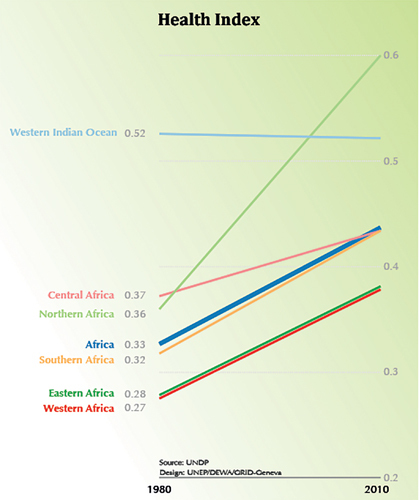 According to the Report, by 2050 Africa’s population will have doubled. The continent will then be home to 2 billion people, the majority of which will still largely depend on agriculture for their livelihoods. “With 94 per cent of agriculture dependent on rainfall, the future impacts of climate change including increased droughts, flooding and sea-level rise may reduce crop yields in some parts of Africa by 15–20 per cent,” said UN Under-Secretary-General and UNEP Executive Director Achim Steiner. “By integrating climate change adaptation strategies in national development policies governments can provide transitional pathways to green growth and protect and improve the livelihoods of hundreds of millions of Africans,” he added. This practical publication responds to the 2013 Africa Adaptation Gap Report which was endorsed by the African Ministerial Conference on the Environment (AMCEN), and which identified the potentially crippling costs of climate change for Africa. “Incipient threats posed by climate change, particularly in terms of potentially overturning decades of development efforts in Africa, suggest that future development efforts should incorporate greater resilience to climate change impacts,” said the President of AMCEN and Minister of State for the Environment, United Republic of Tanzania, Hon. Dr. Binilith Mahenge. “The Poverty-Environment Initiative (PEI) of the United Nations Development Programme (UNDP) and the United Nations Environment Programme (UNEP) is a global programme that supports country-led efforts to mainstream poverty-environment linkages into national development and sub-national development planning, from policymaking to budgeting, implementation and monitoring. This news was provided by UNEP, 12 August 2014, and by published on the Horizon International Solutions Site 14 August 2014.